The NC STEM Center serves as a web portal for STEM education-related resources and activities in North Carolina. Visitors to the NC STEM Center site are able to peruse and access various content through the primary menu items of Learn, Find, Share, and Connect. By becoming a registered user on the site, additional content is made available, such as information related to grant opportunities, significant events, and the ability for information to be shared based on a user’s profile and interests. Additionally, a registered user may interact with the site for the purpose of sharing STEM activities for greater awareness and information exchange. Register with the NC STEM Center site by clicking the Register Now! button below or the link located in the very top-right of the home page (also found within the header of every page). A form will appear for completing first name, last name, and email address, and a profile which allows one to indicate a certain role (or multiple roles as it relates to functions within the STEM community), areas of interest and to create a username and password. If you are a lead contact for a STEM program or activity and would like to “Share” your programming on the NC STEM Center site, you should also select the checkbox for “Add me to the NC STEM Center Connectory Exchange as a Program Administrator.” This is an additional feature of the NC STEM Center site that interfaces with The Connectory seamlessly. NOTE: Be sure to select the checkbox for “Add me to The NC STEM Center Connectory Exchange as a Program Administrator” if you are interested in “Sharing” a Program and Opportunities on the site. Our definitions may not match yours – this can cause confusion when entering data. Program – Providers and organizations that offer STEM opportunities. Opportunity – Summer camps, workshops, career fairs, competitions, and other time-bound STEM events. Program Administrator Selection: If you selected the check box for “Program Administrator” when you registered, you should receive an email within 5 minutes of completing registration. You need to confirm your ownership of the account to be able to create and manage STEM programs and opportunities through the NC STEM Center. If you have not received an email within 10 minutes, send us a note at support@ncstemcenter.org. Be sure to check your spam filter since your email system may block an automated message. By including Program Administrator in your registration profile, you will have the ability to add your Program and Opportunities to the largest database of STEM programming across the state and through a partnership with The Connectory, the nation as well. All within a single submission point. Once registration is complete, you will have the ability to update and modify your profile based on your continued circumstances and desired interaction with the NC STEM Center site. Adding (Share) Your Program Information: This is your organization or overarching program. In most cases you will have a single program that highlights the organization itself. After you save your profile information, click the Add New Program button on the next screen to get started. NOTE: You can add program/provider info later by clicking the + quick-add shortcut in the top menu or from your Dashboard page. 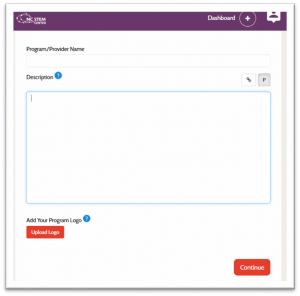 Enter basic information about your overarching program on the New Program/Provider screens, clicking the Continue button to move to the next screen. Please note that once you add or edit a program, it is sent to us for review. During this 24- to-48-hour window the program will not be visible on the site. You will receive an e-mail confirmation that we received your program submission, and then another email confirmation once it has been reviewed. If you experience any difficulties, please email support@ncstemcenter.org and someone will assist you as soon as possible. 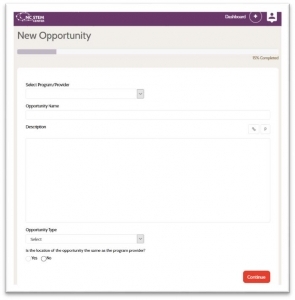 Enter information on the New Opportunity screens, clicking the Continue button to move to the next screen. Please note that once you add or edit an opportunity, it is sent to us for review. During this 24- to-48-hour window the opportunity will not be visible on the site. We Review & Publish: Please note that once you create a program and when appropriate, add opportunities related to your program, they are sent to us for review. During this 24-to-48 hour window, they will not be visible on the site. Please contact us at support@ncstemcenter.org if your Program Opportunity has not been added within 48 hours. The Connectory: The largest and and most comprehensive database of STEM programs and opportunities in the U.S. The technology behind this national database powers our “Find” page and the “Share” feature. Any programs and opportunities listed on the NC STEM Center are also shared with the Connectory’s national database. Opportunity: Summer camps, workshops, career fairs, competitions, and other time-bound STEM events. Opportunity types include: Afterschool Program, Community Event, Competition, Conference, Drop-In Program, Fair/Festival, Field Trip, In School Program, Mobile Program, Online, Overnight, and Summer Camp. Organization: The lead entity for a program. In many cases, the program and organization are one and the same and you can leave this optional field blank. You would use this field, for example, if you are part of a larger organization (such as a university or museum) that has more than one department that offers STEM programming and events. Partner: The process of networking, sharing resources, and collaborating on projects with other program providers and organizations. You can search for partners by collaboration interest, resources, and in the Provider Portal. Program: Providers and organizations that offer STEM opportunities. These listings can be used to aid collaboration.